It's hard to get over how good the 6.59-inch, OLED panel on the vivo NEX S actually looks. The almost total lack of bezels definitely plays a major part in the overall effect, but there is clearly more to it, as well. For one, the absence of a notch, or any other interruption of the entirety of the display enhances the visual appeal, in our opinion. Also, at 6.59 inches in diagonal, the panel is, unquestionably huge. It also comes courtesy of Samsung, which translates to punchy colors, infinitely deep blacks, and equally infinite contrast levels. Arguably, you can't really do any better than a Super AMOLED panel on today's mobile scene. Plus, a quick check in our database reveals that Samsung, themselves, haven't really put out many models with a Super AMOLED of this size. That being said, the display is not perfect. Depending on your criteria, you could find the FullHD+ 1080 x 2316 pixel native resolution sub-optimal. We can definitely understand such an argument. However, even at this massive diagonal, the math works out to 388ppi pixel density. This makes the vivo NEX amazingly sharp and with perfectly crisp visuals, in our book. Plus, it has the added benefit of better power efficiency for the panel. In terms of display performance, the vivo NEX scores quite comparable to other recent Samsung devices. That, of course, means perfect blacks and infinite contrast. Maximum brightness in the default mode is just shy of 460 nits. Funnily, we couldn't locate the ambient light sensor on the front of the phone although it clearly has automatic screen brightness. Regardless, sunlight legibility on the NEX S is great. Certain Samsung Galaxy devices still manage to score higher, but in practical terms, the NEX S remains perfectly usable, even under direct sunlight. Color reproduction is somewhat of a mixed bag. If you value color accuracy on your devices, then the NEX S might not be the ideal choice. At least in the current state of Funtouch OS, that is, since it doesn't offer any custom white point or color adjustments. Vivo also decided to show off the AMOLED goodness, increasing most color saturation, especially red and yellow. Still, even with the rather extreme color profile, the panel has an average deltaE of 6 and a maximum of 9.6 - not what we would consider properly calibrated, but not horrible either. Despite all the extra hardware, crammed inside the NEX S, vivo still managed to fit a 4,000 mAh battery. To be fair, it is an 8mm thick phone but we've seen far less juice go into thicker units in the past. So, adding thing up, we get a large battery, an efficient 10nm manufacturing process on the Snapdragon 845 and an equally efficient Super AMOLED display. The vivo NEX S, thus, has all the makings of an excellent battery performer. And our standardized tests indeed painted an impressive battery life picture. Even considering the big 4,000 mAh battery, 101 hours of endurance is still an accomplishment in its own right. In most regards, the Snapdragon 845 and its X20 LTE modem performed as expected. 3G call time is at the upper end of the spectrum, while standby time is right around the average for this chip. We have to commend vivo for optimizing the default player app particularly well since nearly 20 hours of consecutive, offline video playback are no small feat. On the flip side, though, the default web browser had a few issues with seemingly random redirects to non-existent pages, while running our standard website browser script. Hence, we ran this portion of the test using Chrome instead. Like we mentioned earlier, the NEX S comes bundled with a surprisingly compact charger, given its solid 22.5W output. This seems to go beyond the Quick Charge 3.0 standard, capped at 18W. It could be some sort of Power Delivery implementation, which does make sense, since the Snapdragon 845, is compatible with Quick Charge 4+ and consequently up to 27W via the Power Delivery spec. In real-life terms, that allows you to get the massive 4,000 mAh battery up from 0% to about 50% in half an hour. 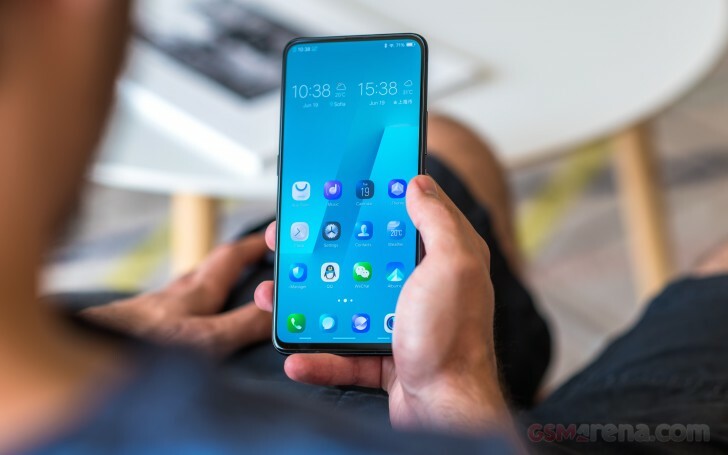 Our endurance rating denotes how long a single battery charge will last you if you use the vivo NEX S for an hour each of telephony, web browsing, and video playback daily. We've established this usage pattern, so our battery results are comparable across devices in the most common day-to-day tasks. The battery testing procedure is described in detail in case you're interested in the nitty-gritties. You can also check out our complete battery test table, where you can see how all of the smartphones we've tested will compare under your own typical use. The vivo NEX S only has a single loudspeaker at its disposal. Unfortunately, with all the other things going on, the design team apparently hasn't figured out a way to enable a hybrid setup. Come to think of it, that might not even be possible with the piezoelectric under-display speaker. In any case, the NEX S is pretty loud. It also has a few equalizer and audio optimization options to play around with. However, these seem to have very little effect on the actual output through the speaker. As far as quality goes, both music and voices come out pretty clean, with little to no distortions. But, as expected, the sounds stage is nothing to rave about. The vivo NEX S did well in the active external amplifier part of our audio output quality test through the jack. It delivered average loudness matched with perfect clarity. Plugging in the headphones brought the volume down to just below average but ot caused little in terms of distortion. Stereo crosstalk rose an average amount but the overall output remained solid.